The special issue of Scientific American has a vast range of topical articles on the issues of cities and how they could become “better” and “smarter” both laconic buzz words of media and big business fixation, most of the content is on line as well as much that is not in the newsstand version – well worth perusing both the online and paper versions. image: Foster + Partners; Apple Inc. Within the framework of a Russian “urban renaissance” a continuation of the critique of current architecture and its lack of urbanity now radically implemented in a research and and educational program led by Rem Koolhass and OMA amongst other luminaries of the ‘architecture’ profession somewhat ironically in that the critique of complicity in the depletion of meaning in the face of individualistic and materialistic control should find a place in contemporary Russia where the intensity of oligarchic materialism seems at a peak! This is well worth watching if you are at all interested in relevance and social impact of our design interventions. Jiang Jung, Strelka instructor and chief editor of Urban China, presenting a study of geopolitics and urbanization in Russia and China. Strelka is located on the Moscow River in an adapted section of the former Red October Chocolate Factory. It was conceived during a casual conversation among friends at the Venice Biennale 2009, based on shared concern over the course of urban development under former mayor Yury Luzhkov. This group of design and media luminaries — including Alexander Mamut, once known as “the Yeltsin family banker” — inspired Rem Koolhaas and OMA/AMOto develop and implement an educational program aimed at preparing designers to address complex problems in Russia and around the world. The institute was announced at last year’s Venice Bienniale and the first group of students began in October. A discussion from Tom M. Wolters on a linkedin group leads to the following article from bURB by fiona liu which reflects the incredible speed with which an autocratic top-down planning system can implement radical changes to its system – it remains to be seen if these changes a will in fact be implemented as designed and that they will give the desired results – but there is no doubt that the Chinese authorities are serious about this – I also wonder how the aspirations and needs of common people are going to be impinged on or squashed by these somewhat grandoise schemes and how Western consultants and firms are willing to rush into these schemes without knowledge of how the norms that they are based on were arrived at – i.e. how were the indicators used arrived at and how do we know they are in fact right? FYP or five year plans have an ominous ring of the Stalinist and Mao years. China has made the international commitment to reducing carbon intensity by 40% to 45% by 2020. The period from 2005 to 2020 takes in three Five-year plans (FYPs), the 11th, 12th and 13th. (FYPs). FYP is one of China’s most important long-term planning policy tools, which sets down and clarify national strategy, reflecting a key strengths of the socialism is its capacity for long-term, national-level planning – its political continuity. The FYP also represent the feature of Chinese government’s largely top-down management character: central government forces local government to make emissions cuts and, to achieve that, local governments have to enforce power cuts. In the 11th FYP (2005-2010), China has seen a drop of 19.06% in energy intensity, meaning a drop in carbon intensity of 20% to 21%. Starting from 2005, The 11FYP calls for “building a resource-conserving and environmentally friendly society”, emphasizing the importance of “sound urbanization”, and expressed the intention to pursue a “new pattern for urban development which is resource-conserving, environmentally friendly, economically efficient, and socially harmonious” . 12 FYP addresses urbanization as a central issue, and emphasizes on inclusive growth. FYP projected that from 2011 to 2015, the population living in urban areas will continue to grow and is likely to reach 51.5%. 12 FYP targets at creating 45 million jobs in urban areas, keeping registered urban unemployment below 5% and boosting domestic consumption. As part of the drive to realize these goals, the government will boost investment in “improving people’s livelihood”, for example to built and renovate more apartments for low-income families, and extend the current urban pension schemes to including the 357 million urban residents. 12 FYP aims at 16% cut in energy intensity, corresponding to 17% cut in carbon intensity. Following the adaptation of the 12 FYP, a new round of revision to the both sets of eco-city guideline in both ministries are expected to come soon. However, experience from Caofeidian and CCTEC shouldn’t be expected to be incorporated into national eco-city guideline very soon. Vice minister of MoHURD Qiu Baoding’s June 27th speeches on Chinese Urban Development and Planning Conference in Yangzhou, Jiangsu Province, indicated the likely direction to this round of revision to the MoHURD defining of eco-cities. 2) the location of this eco-city should be within the 30km radiant circle with the center downtown, and optimally it should be within 100 km from big cities. 3) close to express way, railway (or prolonged urban rail tracks), either existing or planned. 5) working governance mechanism, including system refor, capital and regulation support (no clear statement where the money should come from). What if architects designed structures with not only people in mind, but also the microbes that inhabit buildings, too? Is there a way to design environments, namely in the healthcare arena, that are conducive to keeping a beneficial mix of microbes thriving, while also remaining clean? How can biologists and ecologists contribute to the field of sustainable design, by studying and helping to develop new materials? These are all questions that are central to the research ofJessica Green, an ecologist, engineer, and professor at both the University of Oregon and the Santa Fe Institute. She’s also a TED 2011 Senior Fellow; last year, she was a TED Fellow. Green co-founded and directs a lab at the University of Oregon known as the Biology and the Built Environment (BioBE) Center, where she and her colleagues are exploring a new area of design that they call the “architecture-biology interface.” They are currently looking to partner with healthcare facility designers to measure and study how design and microbes affect each other, the environment (both natural and man-made), and humans, of course. She recently presented her work at the TED Global conference in Edinburgh, Scotland in July. The curators of TED just released the video of Green’s TED Talk to the public on August 6. The clip includes the debut of a visualization from scientific animation designers XVIVO that they created with Green to help viewers understand how microbes enter, exist, and interact in the human world from a microbe’s point of view. Team Camí Comtal (AldayJover, RCR and West 8 ) winning entry provides relief to the bustling city of Cerdá, introducing a new green slow route to counter today’s urban frenzy and activity, represented by the (other) Diagonal Avenue. The new green corridor, four kilometer long, extending from the city’s fringe deep into the heart of the centre is the successful result of the tunneling of the new Very fast Train route from France to Barcelona Sagrera/Sans. The urban precincts on either side of the route which used to be separated by railway yards are now linked by a series of parks. A new green diagonal axis is extended into the core of Barcelona thanks to the burial of the existing railways. This new public space is a means to connect the sea, the city and its natural surroundings. 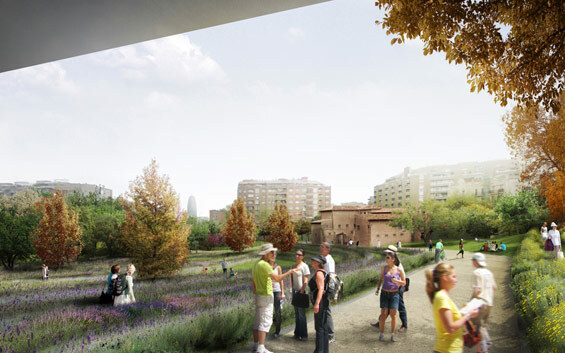 The new La Sagrera linear park or Parc del Camí Comtal represents a new ‘Slow’ Barcelona that gives relief to the urban rush of the city of Cerdá. It greatly adds biodiversity as it introduces a new slow and easy green cross, facing the famous Diagonal avenue, paradigm of the urban life.